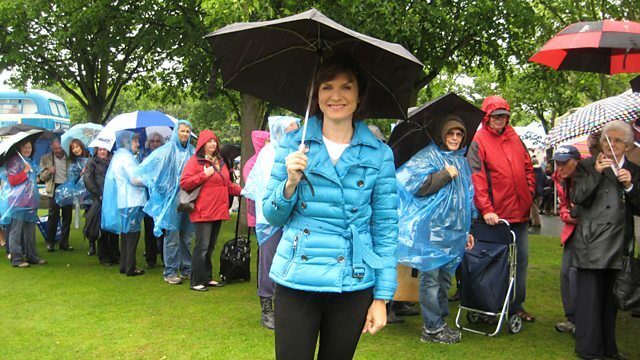 Fiona Bruce and the team visit Port Sunlight on the Wirral. At Port Sunlight the Basic Better Best challenge came from our resident furniture specialist Christopher Payne. The task for Fiona and the visitors was to work out which of these three tea caddies is worth£100, which one is worth £5,000 and which is worth £10,000? What’s in a tea caddy? Quite simply, tea caddies are small boxes or canisters used to store tea. It might be difficult to imagine now but in the early 18th Century, tea was a seriously valuable commodity. Today 1lb of tea it would probably cost about £3 or £4, but back then it would be the equivalent of about £70, so it was important to keep it locked away in caddies and safe from prying hands. As tea was such a luxury item, it made sense that the caddies storing it were also luxurious and often highly decorated. What separates the good from the bad? BASIC – This is a modern reproduction of a late 18th Century caddy. It’s made from turtle shell with silver inlay so all the materials are right, but it simply looks too new. It’s very difficult to tell the difference. A genuine one would be worth about £5,000 so if you see one like this for sale at a low price, then it probably is too good to be true. It’s also worth noting that the sale of new turtle shell is now prohibited – see below. BETTER – This one was made in 1850 and it’s the real deal. It’s in the shape of a melon and these quirky fruit shapes are really sought after by collectors. It’s worth noting that there are a lot of fakes of these around so you might want to get a second opinion. A genuine one, such as this, is worth £5,000. BEST - This dates from 1780 and is made from red turtle shell which is incredibly rare. It’s inlaid with ivory and is incredibly well made. Because it’s a very early caddy and it’s made from a rare material, it would be worth £10,000. Since 1973, the international trade of many endangered animals and plants has been regulated by CITES (the Convention on International Trade in Endangered Species of Wild Fauna and Flora). Turtle shell is one of the things covered by CITES and trade in it is restricted. Items made from turtle shell that are old (pre-1947) may not require a licence to be sold or traded, however any newer items almost certainly will. Those people making fake tea caddies which look older are trying to bypass these regulations. If you are unsure, it’s a good idea to get a second opinion from a reputable auction house or from DEFRA (Animal Health) who are the licencing authority in the UK. From 1679 until 1998 Tea Auctions were held regularly in London. They were so popular that by the 1950s a third of the world’s tea was bought through that auction.